A perfect gift book for all cycling fans – the A-Z of cycling from Arrivée to Zoetemelk. Beautifully illustrated by renowned cycling artist Mark Fairhurst, P is for Peloton is packed with fun facts from the amazing to the bizarre. A modern-day classic that is recognised as one of the best books ever written about the sport. Brilliantly conceived and best read at a break-neck pace, it is a loving, imaginative and passionate tribute to the art of cycle racing. A fun illustrated guide to the world of cycling and all things bike-related. This beautifully designed book presents cycling in a way you’ve never seen before. Written in conjunction with the man himself, this fascinating book documents LeMond’s career year by year – with unique and exclusive photography depicting the racing times of this exceptional bike rider. 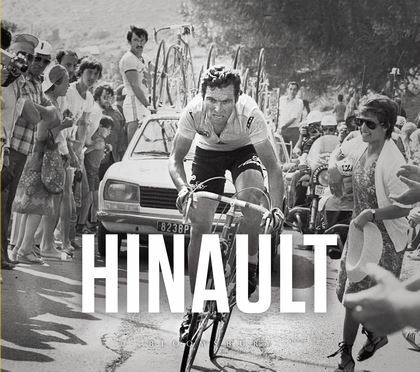 The life of Bernard Hinault – the French former cyclist who won the Tour de France five times – is recounted through stories, quotes and photographs in a beautifully packaged celebration of this great cyclist’s career. The first detailed account of the Festina affair, which ripped apart the 1998 Tour de France. Alasdair Fotheringham uncovers, step by step, how the world’s biggest bike race sank into a nightmarish series of scandals that left the sport on its knees. He explores its long-term consequences – and what, if any, lessons were learned. Taking their lead from the professionals, keen cyclists are looking to add off-the-bike exercise to their weekly training programme. Informative and accessible, this is a comprehensive guide to essential strength, stretching and core work. This bestselling guide takes you through the bike-fit process so you can maximise your cycling potential. Lower back pain after a long weekend ride? Shoes worn out on one side? A numbness in your hands? Phil Burt has worked with hundreds of cyclists to help them solve these and many other classic cycling niggles. Yoga for Cycling uses yoga postures to both stretch and lengthen those short, tight cycling hotspots in a way that is time-efficient and highly targeted. James Witts takes us into the world of marginal gains to find out how today’s elite cyclists gain the advantage – physically, mentally and mechanically. The Tour de France may provide the most obvious fame and glory, but it is cycling’s one-day tests that professional riders really prize. Toughest, longest and dirtiest of all are the so-called ‘Monuments’. This awe-inspiring book tells the tumultuous history of these extraordinary races. Ride the Revolution brings together the best cycling writing from women involved in the sport at all levels. It celebrates the glorious, sometimes murky, often bizarre and frequently hilarious world of cycling in all its soapy operatic glory – from the professional sport to the club run, on the roadside and in the saddle, behind the scenes and on the massage table. Feeling inspired? Head over to www.bloomsbury.com to browse all our cycling books & save a festive 45%! This entry was posted in Cycling, Special Offers and tagged books for Christmas, Cycling, cycling books, Cycling Christmas, Tour de France. Bookmark the permalink.